Sporting KC began play in 1996 as a charter team in the league, then known as the Kansas City Wiz. The team was founded by Lamar Hunt in 1995. Since moving across the state line, they have been the only major professional sports league franchise to play their home games in Kansas. For the majority of their existence, the franchise were known as the Kansas City Wizards. The team rebranded in November 2010, coinciding with its move to their home stadium, now known as Children's Mercy Park. The franchise has won the MLS Cup twice (2000, 2013), the Supporters' Shield in 2000, and the U.S. Open Cup in 2004, 2012, 2015 and 2017. The club also has a reserve team, Swope Park Rangers, that plays in the second-tier United Soccer League. The Kansas City MLS franchise was founded by Lamar Hunt, who was also the founder of the American Football League, the Kansas City Chiefs, the United Soccer Association, and Major League Soccer. The Kansas City Wiz played their first game on April 13, 1996, defeating the Colorado Rapids at Arrowhead Stadium, 3–0. The Wiz players included Preki, Mo Johnston and Digital Takawira, and were coached by Ron Newman. The team finished third in the Western Conference (fifth overall) in 1996 regular season with a 17–15 record, qualifying for the first ever MLS Playoffs. In the 1996 conference semi-finals, the Wiz beat the Dallas Burn in three games, winning the final game in a shootout, before losing the conference final to the LA Galaxy. Following the 1996 season, the Wiz changed names, becoming the "Wizards", following legal action from electronics retailer The Wiz. For the 1997 MLS season, their record was 21–11, sufficient for the Western Conference regular season championship. Preki was named 1997 MLS MVP. In the first round of the playoffs, the Wizards lost to the last-seeded Colorado Rapids. The Wizards had losing records for the 1998 and 1999 seasons, finishing last in the Western Conference both years. The Wizards fired Ron Newman early during the 1999 season, and replaced him with Bob Gansler. The Wizards finished the 1999 season with a record of 8–24, which put them in last place in the Western Conference once again. In 2000, their first full season under Bob Gansler, the Wizards opened the season on a 12-game unbeaten streak. Goalkeeper Tony Meola recorded an MLS record shutout streak at 681 minutes and 16 shutouts, and won MLS Goalkeeper of the Year and MLS MVP. Peter Vermes was named 2000 MLS Defender of the Year. The Wizards finished the 2000 regular season 16–7–9, the best record in the league, winning the MLS Supporters' Shield. In the 2000 playoffs, fell behind 4 to 1 to the LA Galaxy, but Miklos Molnar scored a penalty kick in game three to send the series into a tiebreaker, where he scored again to send the Wizards to their first MLS Cup. At RFK Stadium in Washington, D.C., the Wizards, with the league's best defense, faced the team with the league's best offense, the Chicago Fire. The Wizards took the lead on an 11th-minute goal by Miklos Molnar. The Fire put ten shots on goal, but Tony Meola and the defense held, and the Wizards claimed their first MLS Cup Championship. Tony Meola was named 2000 MLS Cup MVP. After the loss of Preki to the Miami Fusion, the team struggled to defend their championship in 2001, making the playoffs as the 8th seed with a record of 11–13–3. In the first round, the Wizards' reign as champion ended with a 6 points to 3 loss to Preki and the Miami Fusion. Despite getting back Preki, the Wizards sat in last place in the Western Conference in 2002. They made the playoffs with a record of 9–10–9. The last two teams in the East, the MetroStars and D.C. United missed the playoffs, which propelled the Wizards into the playoffs. In the first round, the team would fall, 6 points to 3 to eventual champions, Los Angeles Galaxy. The Wizards returned to the top half of the West in 2003 with a record of 11–10–9. In the first round of the playoffs, the Wizards defeated the Colorado Rapids in the aggregate goal series, 3–1. That set up a one-game showdown with the San Jose Earthquakes the winner would advance to the 2003 MLS Cup. The Wizards took the lead, but the Earthquakes battled back and forced golden goal in overtime by Landon Donovan in the 117th minute, which sent his team to the 2003 MLS Cup and the Wizards home. The Wizards started out 2004 mediocre, before turning around in the summer. The Wizards finished the season on a six-game unbeaten streak to finish 14–9–9 for the Western Conference regular season championship. Goalkeeper Tony Meola went down with injury and backup Bo Oshoniyi filled as a replacement. In the first round of the 2004 playoffs, the Wizards lost the first game to San Jose Earthquakes, 2–0. In the second game, however, the Wizards scored 2 goals before Jack Jewsbury scored in stoppage time to move KC onto the conference final. In the conference final, the Wizards held off the Los Angeles Galaxy to reach their second MLS Cup. In the 2004 MLS Cup final, the Wizards went up against D.C. United at the Home Depot Center in Carson, California. The Wizards Jose Burciaga scored in the sixth minute, but D.C. United replied with three goals in the first half. KC was given a lifeline in the 58th minute as Josh Wolff scored the first penalty kick in MLS Cup history, but KC lost the 2004 MLS Cup final 3–2. Following MLS expansion, the Wizards moved to the Eastern Conference in 2005. By the end of the 2005 season, despite the solid play of 2005 MLS Defender of the Year Jimmy Conrad, the Wizards found themselves outside the playoffs with a record of 11–9–12. After the season, the team's veteran leader, Preki announced his retirement. In the 2006 season, the Wizards just missed out on a playoff berth with a loss to the New York Red Bulls on the final day of the regular season, finishing with a 10–14–8 record. Lamar Hunt sold the club in August 2006 to OnGoal, LLC, a six-man ownership group led by Cerner Corporation co-founders Neal Patterson and Cliff Illig, a local group committed to keeping the Wizards in Kansas City. The club dedicated its 2007 season to Lamar Hunt, who had died in December 2006. A good start earned them four wins in the first seven weeks of the season. The club picked up goalkeeper Kevin Hartman from the LA Galaxy to help with that position. Despite winning just four games after the All-Star break, Kansas City managed to finish fifth in the East at 11–12–7 and qualify for the playoffs. The club shifted over to the West as a result of a playoff format change, the Wizards played against Chivas USA. With the Wizards Davy Arnaud's goal in the first game to win the series, the defense and Kevin Hartman did the rest and kept Chivas USA off the scoreboard. In the conference final, the Wizards came up short to the Houston Dynamo, 2–0. In 2008, the Wizards played their home games at CommunityAmerica Ballpark in Kansas, and ended a four-year playoff drought by posting an 11–10–9 record, good enough for fourth place in the Eastern Conference. Facing the Columbus Crew, the Wizards earned a 1–1 tie in Game 1 of the first round series, but with a 2–0 loss in Game 2 the Wizards lost the aggregate series 3–1. In the 2009 season, the Wizards remained at CommunityAmerica Ballpark, but struggled to score. They went 426 minutes without scoring a goal, the longest streak of the season. In August 2009, with the team holding a 5–7–6 record, KC fired Head Coach Curt Onalfo, and named General Manager Peter Vermes the head coach. The Wizards finished with the worst home record in the league, and at 8–13–9 were third to last in the league standings. Top players were Claudio López (8 goals & 7 assists) and Josh Wolff (11 goals), who sparked the Wizards offense. In 2010, the Wizards finished third in the Eastern Conference and narrowly missed qualifying for the playoffs. With the rebranding (of Wizards to Sporting) the team follows a recent trend in MLS of adopting European-style names, such as Toronto FC, D.C. United, and Real Salt Lake. The title "Sporting" has its origins in Iberia where it is used only by multi-sports clubs with a history of having multiple departments fielding teams across different sports. Kansas City's use of the term has been criticized for inaccuracy and cultural appropriation. At the rebrand announcement, the Kansas City's president announced plans to add a rugby club and lacrosse club. Since then, a partnership with the Kansas City Blues Rugby Club has been announced, but the two sides are not part of one "Sporting Club" and no lacrosse team has been established. The rebranding was met with a mixture of both excitement and disdain by fans when originally announced. With the opening of the new Children's Mercy Park in Kansas City, Kansas, Sporting became the first major-league team to have played in stadiums on both sides of the state line in Kansas City, while Kansas City became the only U.S. metropolitan area other than New York City to have major professional sports teams playing in different states. Because Children's Mercy Park was not ready for the beginning of the 2011 season, Sporting Kansas City played its first ten games on the road, only winning one game. Once the road trip was over, the team found more success and ended the regular season with the most points of any Eastern Conference team. After defeating the Colorado Rapids on a 4–0 aggregate in the Eastern Conference semifinals, Sporting lost to the Houston Dynamo 2–0 in the Eastern Conference finals. KC began the 2012 season with seven consecutive wins, in the process setting an MLS record for 335 minutes without allowing a shot on goal. The team finished the regular season first in the East with an 18–7–9 record. KC was led by Graham Zusi, who delivered a league-leading 15 assists and was named finalist for 2012 MLS MVP, Jimmy Nielsen, who notched a league leading 15 shutouts and was named 2012 MLS Goalkeeper of the Year, and Matt Besler, who was named MLS Defender of the Year. KC lost to the Houston Dynamo in the conference semifinals. KC won the 2012 U.S. Open Cup, defeating Seattle Sounders FC in the finals, to qualify for the 2013–14 CONCACAF Champions League. In 2013, Kansas City took advantage of MLS's newly-created retention funds to renew contracts with U.S. national team players Graham Zusi and Matt Besler. Sporting had finished second in the Eastern Conference and overall with 17 wins, 10 losses, and tied 7 times in the regular season. 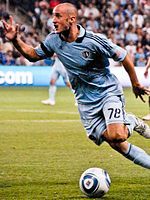 In the 2013 MLS Playoffs, Sporting KC defeated NE Revolution in the conference semifinals and Houston Dynamo in the conference finals, advancing to MLS Cup 2013. SKC defeated Real Salt Lake on penalties (7–6) after the match was tied 1–1 in regulation and overtime. It was the coldest MLS Cup game on record. In the 2014 MLS Cup Playoffs, Sporting were eliminated in the East Knockout Round by the New York Red Bulls. On October 27, 2014, the league announced that Sporting, along with the Houston Dynamo, would move from the Eastern Conference to the Western Conference when two teams from East Coast states, New York City FC and Orlando City SC, joined the league in 2015. Sporting finished sixth in the Western Conference that year, again qualifying for postseason play due to the expanded twelve-club field in the 2015 MLS Cup Playoffs. They were eliminated in the Western Knockout Round by the Portland Timbers, 6–7 in a Penalty Shootout. Sporting's co-owner Neal Patterson died due to soft tissue cancer in July 2017. Kansas City unveiled wordmarks that was worn on the team's jerseys and on Children's Mercy Park to commemorate their late owner. Later that month, the club traded Dom Dwyer to Orlando City in exchange for $1.6 million (in general and targeted allocation money with additional incentives), setting the record for the most expensive internal trade in league history. The team won the 2017 Lamar Hunt U.S. Open Cup, defeating the New York Red Bulls 2–1 in the final. The win gave Sporting their fourth Open Cup title, and their third in the last six years. The victory extended head coach Peter Vermes's record to 4–0 in cup finals and championship games with the club. In Open Cup history, Kansas City became just the second franchise in the single elimination tournament to have won four Open Cup finals in the same number of appearances. Sporting Kansas City's official colors are "sporting blue" and "dark indigo" with "lead" as a tertiary color. The primary logo is composed of a teardrop-shaped shield containing a stylized representation of the Kansas-Missouri state line with "sporting blue" stripes on the "Kansas" side and an interlocking "SC" on the "Missouri" side. The shield's contour alludes to the team's former logo while under the "Kansas City Wizards" appellation. The stateline represents Sporting's fanbase in both of the Kansas and Missouri portions of the Kansas City metropolitan area. The eleven alternating horizontal stripes of "sporting blue" and "dark indigo" forming the state line are a nod to the number of players a team fields. The "SC" (for Sporting Club) is inspired by Asclepius' rod representing health and fitness, a Greek statue called the Winged Victory of Samothrace – alluding to strength and movement, and to the Spanish architecture of Kansas City's Country Club Plaza. Beginning in 2013, Ivy Funds became the club's first uniform sponsor, and a new home and away jersey design was unveiled, as well as an alternate argyle design. Arrowhead Stadium, is the Home Stadium of the NFL's Kansas City Chiefs; was the then Kansas City Wizards' (Sporting KC) home for over a decade. From 1996 through 2007, the Wizards played home games in Arrowhead Stadium, the American football stadium mainly used by the Kansas City Chiefs. Wizards management kept the west end of Arrowhead tarped off for the first 10 years of play, limiting seating near the field. In 2006, fans could sit all the way around the field, but, in 2007, seating was [again] only available along the sidelines. After the 2007 final season at Arrowhead, the Wizards continued to use the stadium for select large events. In 2008, the club played a regular season home game against the Los Angeles Galaxy at the stadium to accommodate the large crowd expected for David Beckham's Galaxy debut. Again in 2010, the Wizards played a friendly here against English club Manchester United, winning 2–1. The Wizards entered an agreement with the Kansas City T-Bones to use their home stadium, CommunityAmerica Ballpark, during the 2008 and 2009 seasons. The deal was later extended to include 2010. The stadium, located across the state line in Kansas City, Kansas, built a new bleacher section financed by the Wizards to increase its capacity to 10,385. This move made the Wizards the third MLS team to share their home ground with a baseball team. D.C. United had been sharing RFK Stadium with Major League Baseball's Washington Nationals in Washington, D.C., before the latter's move into Nationals Park. The San Jose Earthquakes used Oakland–Alameda County Coliseum in Oakland, home of the Oakland A's (and Oakland Raiders), for certain games during the 2008 and 2009 seasons. The Wizards originally planned to return to Kansas City, Missouri, and build a new stadium there – tentatively called Trails Stadium – as part of a major mixed-use development. The team had received all required approvals and was awaiting site demolition; however, the 2008–09 financial crisis ultimately led to the scrapping of the Trails Stadium project. The team sought a new site for its stadium, quickly settling on a development in Kansas City, Kansas, known as Village West, near CommunityAmerica Ballpark and the Kansas Speedway. In September 2009, the developer asked Wyandotte County (in Kansas) and Kansas state officials for permission to use revenues from existing tax increment financing in the Village West area to help finance the soccer complex. On December 17, Wizards president Robb Heineman provided an update on the stadium situation, identifying the Kansas City, Kansas, location as near final, pending the signature of the final agreements. On January 19, 2010, Wyandotte County approved the bonds to help finance the stadium, and on January 20 the groundbreaking ceremony was made, with Wizards CEO Robb Heineman using heavy machinery to move dirt on the construction site. When the Kansas City Wizards first rebranded as Sporting Kansas City, they built Livestrong Sporting Park. Spending $200 million on the complex, it was the first "European style" soccer complex in the United States. Name rights were held by the Livestrong Foundation until the downfall of Lance Armstrong from his doping scandal; Sporting Kansas City subsequently changed the name of their stadium to Sporting Park. On November 19, 2015, the stadium was renamed to Children's Mercy Park in a ten-year deal with Children's Mercy Hospital. The primary supporters' section, "The Cauldron", is the centerpiece of Children's Mercy Park. Sporting regularly sells out its matches, with over 100 straight sellouts as of August 2017. Sporting has 14,000 season-ticket holders, with a wait list for season tickets of 3,000 people. Sporting KC has a relatively young fan base, with season-ticket holders having an average age of 29.7 years. Sporting KC works with Sporting Innovations, a consulting firm spun off from the team that focuses on fan engagement. Administrators from several college football teams, such as the Florida Gators, have visited Sporting KC to learn from the team's success at fan engagement. The main supporters group of Sporting Kansas City cheers in the Members' Stand on the North side of Children's Mercy Park and is known as "The Cauldron". The name is derived from the large metal pots used for boiling potions, due to the team's former name Wizards. Since the rebranding in 2010, Sporting have seen dramatic growth in their fan section, with several fan groups adding their voice to The Cauldron culture and atmosphere. Current groups in the north stands along with The Cauldron include, La Barra KC, Brookside Elite, Mass Street Mob, King City Yardbirds, Trenches, Omaha Boys, Northland Noise, Ladies of SKC, and K.C. Futbol Misfits. The South Stand SC cheers from the south end of Children's Mercy Park and is the umbrella group for The Wedge and Ad Astra SKC, while American Outlaws – Kansas City Chapter are also present in the stands. SKC's "Blue the Dog" is the franchise's official mascot. Sporting Kansas City's two primary rivals are Real Salt Lake and Houston Dynamo. Prior to 2017 matches were broadcast in high definition on KMCI-TV (except for nationally broadcast matches). The play-by-play announcer was WHB 810AM 'Border Patrol' host Nate Bukaty, who began broadcasting for the team in the 2015 season. Former Sporting Kansas City goalkeeper Andy Gruenebaum provided color commentary following his retirement after the 2014 season. Color commentary was covered by Jake Yadrich through the 2013 season, after which he transitioned to be the lead analyst on the sidelines during games. Morning reporter Kacie McDonnell of KSHB-TV, a NBC affiliate and KMCI-TV's sister station, served as the network host of the pregame and postgame shows. Matches that are not broadcast nationally are now broadcast on Fox Sports Kansas City, as well Fox Sports Midwest in the St. Louis market. In 2017, Fox Sports Midwest only carried select matches, while in 2018, the club announced the St. Louis market would receive all matches while the Mid-Missouri and Iowa markets would receive most matches. Nate Bukaty continues to provide the play-by-play commentary, while Matt Lawrence is the color commentator and Carter Augustine is the sideline reporter. Regular local radio coverage in English is provided through an official partnership with WHB 810AM and its affiliate ESPN Kansas City 99.3FM. Spanish broadcasting was previously found on KDTD 1340AM, but is on KCZZ (ESPN Deportes Kansas City 1480AM) for the 2018 season. The broadcasts are produced by Jorge Moreno and feature the voice of 13-year MLS veteran Diego Gutierrez along with Ale Cabero, Raul Villegas and Alonso Cadena. For details on former players, see All-time Sporting Kansas City roster. Where a player has not declared an international allegiance, nation is determined by place of birth. Squad correct as of December 20, 2018. Peter Vermes was the first person to win the MLS Cup with the same club as player (2000) and manager (2013). Sporting Legends is an initiative launched in 2013 that pays tribute to the individuals who played an instrumental role for Sporting Kansas City and in the growth of soccer in the region. Preki (2013) — 2005 MLS All-Time Best XI, 1997 and 2003 MLS League MVP, Club's all-time leader in goals and assists. Tony Meola (2013) — 2005 MLS All-Time Best XI, 2000 MLS MVP, 2000 MLS Goalkeeper of the Year, 2000 MLS Cup MVP. Bob Gansler (2013) — 2000 MLS Coach of the Year, 2000 MLS Cup, 2000 MLS Supporters Shield. Peter Vermes (2014) — as player: 2000 MLS Defender of the Year, 2000 MLS Cup, 2000 MLS Supporters Shield; as manager: 2012, 2015 and 2017 U.S. Open Cups, 2013 MLS Cup. 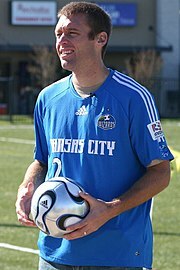 Jimmy Conrad (2014) — 2004–06, 2008 MLS Best XI, 2004 U.S. Open Cup, 2005 MLS Defender of the Year. Lamar Hunt (2014) — A founder of Major League Soccer, owned the Kansas City Wizards 1996–2006. Chris Klein (2015) — 2000 MLS Cup, 2000 MLS Supporters Shield, 2004 U.S. Open Cup, 2002–2005 MLS All-Star. The 73% jump in attendance between 2010 and 2011 coincides with the team's move from CommunityAmerica Ballpark (capacity 10,400) to their new soccer-specific stadium Livestrong Sporting Park (capacity 18,500). ^ "Explore The New Brand at Sporting Kansas City Website". Sporting Kansas City. November 17, 2010. Archived from the original on November 19, 2010. ^ a b "Kansas City rebrands as Sporting KC". Major League Soccer. November 17, 2010. Archived from the original on August 4, 2015. Retrieved July 9, 2015. ^ "Children's Mercy Park Fact Sheet". SportingKC.com. MLS Digital. Retrieved November 8, 2018. ^ "Contact Us / Sporting Kansas City". SportingKC.com. MLS Digital. Retrieved November 8, 2018. ^ "Kansas City Wizards Change Name To Sporting Kansas City". Kmbc.com. November 17, 2010. Archived from the original on March 7, 2012. Retrieved December 3, 2011. ^ "Matchcenter". mlssoccer.com. Major League Soccer. Archived from the original on October 1, 2015. Retrieved October 1, 2015. ^ "Schedule". mlssoccer.com. Major League Soccer. Archived from the original on October 1, 2015. Retrieved October 1, 2015. ^ West, Phil (August 9, 2017). "How Sporting Kansas City got their name". MLSSoccer.com. Soccer United Marketing, LLC. Retrieved December 11, 2018. ^ "SoccerAmerica – MLS: Preki Named 2003 MVP". www.socceramerica.com. November 21, 2003. Archived from the original on June 11, 2016. ^ a b Austin, Kurt (August 2, 2013). "Sporting Legends unveiled to honor club icons". Sporting Kansas City. Archived from the original on October 11, 2016. ^ "Onalfo out as Kansas City head coach". SBI Soccer. August 3, 2009. Archived from the original on September 24, 2015. ^ Young, Mark. "SKC is more than A-OK". ESPN.com. Archived from the original on September 26, 2013. ^ "The Absurdity of MLS Nomenclature". Archived from the original on October 22, 2014. Retrieved December 3, 2018. ^ "Pro Lax in Kansas City?!". Central Iowa Lacrosse & Sports Ramblings. November 22, 2010. Archived from the original on October 2, 2013. ^ "Affiliation Announced with KC Blues Rugby". Sporting Kansas City. Archived from the original on October 6, 2014. ^ "Rebranding in Professional Sports: The Good, Sporting Kansas City". Trademarkology. Stites & Harbison, PLLC. Retrieved November 26, 2018. ^ Bell, Jack (October 27, 2012). "Graham Zusi Emerges as Rising U.S. Soccer Star". The New York Times. Archived from the original on October 27, 2012. Retrieved July 22, 2017. ^ Davis, Steve (August 2, 2013). "About those MLS retention funds: They have already been put to significant use". ProSoccerTalk. Archived from the original on October 8, 2013. ^ "MLS history: the record is set for coldest kickoff temperatures any Major League Soccer match". Archived from the original on January 14, 2014. ^ "MLS announces new strategy for Los Angeles market, 2015 conference alignment". mlssoccer.com. Major League Soccer. Archived from the original on October 28, 2014. Retrieved October 27, 2014. ^ "MLS to expand playoff field to 12 in 2015, will add extra knockout games". Sports Illustrated. Archived from the original on November 28, 2015. Retrieved October 31, 2015. ^ Stafford, Diane. "Cerner co-founder Neal Patterson surprises crowd at health conference". Kansas City Star. Archived from the original on November 20, 2016. Retrieved July 12, 2017. ^ Cummings, Ian; Vockrodt, Steve; McDowell, Sam. "'A profound loss': Cerner CEO Neal Patterson dies from cancer at age 67". Kansas City Star. Archived from the original on July 9, 2017. Retrieved July 10, 2017. ^ "Sporting KC to honor Neal Patterson tonight at Children's Mercy Park". Sporting Kansas City. July 11, 2017. ^ "Orlando City acquires Dom Dwyer in trade with Sporting Kansas City". ESPNFC.com. July 25, 2017. Retrieved July 25, 2017. ^ Kovzan, Sam (July 25, 2017). "Sporting KC acquires up to $1.6 million in Allocation Money from Orlando City SC in exchange for forward Dom Dwyer". Sporting Kansas City. Retrieved July 25, 2017. ^ McDowell, Sam (July 25, 2017). "Sporting KC trades Dom Dwyer to Orlando City SC". Kansas City Star. Archived from the original on July 25, 2017. Retrieved July 25, 2017. ^ DelGallo, Alicia (July 25, 2017). "Orlando City reaches agreement to bring Dom Dwyer back". Orlando Sentinel. Archived from the original on July 25, 2017. Retrieved July 25, 2017. ^ "Sporting Kansas City vs. New York Red Bulls – MatchCenter Boxscore". MLSsoccer.com MatchCenter. Retrieved September 21, 2017. ^ "Sporting KC vs. New York Red Bulls – 2017 US Open Cup Final Preview". September 18, 2017. Retrieved September 21, 2017. ^ Brisendine, Steve (September 21, 2017). "Brisendine: Old ways die hard on wild Open Cup night for Sporting KC, RBNY". MLSsoccer.com. ^ "Sporting Kansas City: Explore Our Brand". Insightkc.com. Archived from the original on November 19, 2010. Retrieved December 3, 2011. ^ "Sporting KC introduces Ivy Funds as club's first-ever jersey sponsor". Mailings.ivyfunds.com. Archived from the original on February 1, 2013. Retrieved January 23, 2013. ^ Kansas adjusts offer aimed at spurring Cerner, Wizards development near speedway, The Kansas City Star, December 8, 2009. ^ "Kansas City Wizards: News: Heineman provides stadium update". January 26, 2010. Archived from the original on January 26, 2010. KC Wizards Official Website. ^ "Hillcrest Road: RH Stadium Update". December 20, 2009. Archived from the original on December 20, 2009. ^ Stadium Approval News[permanent dead link], KC Wizards Official Website. ^ "Hillcrest Road: Dirt Has Moved". January 23, 2010. Archived from the original on January 23, 2010. ^ Tucker, Doug (June 9, 2011). "KC Unveils $200 Million New Soccer Stadium". USA Today. Archived from the original on October 22, 2015. Retrieved October 22, 2015. ^ Paylor, Terez. "Sporting KC's stadium name: Livestrong Sporting Park". The Kansas City Star. Archived from the original on November 20, 2015. Retrieved November 20, 2015. ^ Rovell, Darren. "Livestrong Sporting Park deal set to end". ESPN.com. ESPN. Archived from the original on January 19, 2013. Retrieved January 16, 2013. ^ Tryon, Barrett. "Livestrong Sporting Park Deal is Over Immediately; Renamed Sporting Park". WDAF-TV. Archived from the original on January 18, 2013. Retrieved January 16, 2013. ^ Austin, Kurt (November 19, 2015). "Children's Mercy and Sporting Kansas City announce youth health and pediatric sports medicine initiative". SportingKC.com. Archived from the original on November 20, 2015. Retrieved November 19, 2015. ^ McDowell, Sam (August 18, 2017). "The evolution of a fan base: Sporting KC to reach 100 straight sellouts Saturday". The Kansas City Star. Retrieved April 25, 2018. ^ Wahl, Grant (March 21, 2014). "2014 MLS Ambition Rankings: Toronto FC rises to No. 1 | Planet Futbol - SI.com". Sports Illustrated. Archived from the original on March 21, 2014. ^ a b c d "Sporting Kansas City Supporters". Sporting Kansas City Official Website. ^ "Sporting KC mascot helps school announce efforts to make student's wish come true". kcstar.com. Archived from the original on September 23, 2015. ^ "Broadcast Information". Sporting Kansas City. Archived from the original on February 26, 2016. ^ "Sporting Kansas City Television Network announces affiliates for 2015 season". Sporting Kansas City. Archived from the original on February 25, 2016. ^ Kovzan, Sam (December 20, 2016). "FOX Sports Kansas City and Sporting KC announce multi-year TV agreement beginning in 2017". Sporting Kansas City. Archived from the original on December 29, 2016. Retrieved March 14, 2017. ^ "BROADCAST INFORMATION". Sporting Kansas City. Retrieved June 13, 2018. ^ Austin, Kurt (February 23, 2018). "Sporting KC matches to air on ESPN Deportes KC 1480 AM". Sporting Kansas City. Retrieved June 13, 2018. ^ "Players". Sporting Kansas City. October 13, 2015. Archived from the original on October 13, 2015. Retrieved October 13, 2015. ^ Kovzan, Sam (January 25, 2016). "Jake Reid named Sporting Kansas City President". Sporting Kansas City. Archived from the original on February 29, 2016. Retrieved April 6, 2016. ^ "All-Time: SKC vs. MLS". SportingKC.com. Sporting Kansas City. Archived from the original on September 19, 2015. Retrieved November 4, 2014. ^ "All-Time Records Sporting Kansas City". Major League Soccer. Archived from the original on July 22, 2012. Retrieved May 2, 2012. ^ Austin, Kurt. "Recap: Dom Dwyer's four-goal game leads Sporting KC to 6–2 victory over FC Dallas in U.S. Open Cup". SportingKC.com. Sporting Kansas City. Archived from the original on July 14, 2015. Retrieved July 22, 2015. ^ "MLS Hat Tricks: A Comprehensive Review". CLIMBING THE LADDER. Archived from the original on May 27, 2014. Retrieved May 27, 2014. ^ Sferra, German (May 18, 2017). "Sporting Kansas City 3, Seattle Sounders 0 | 2017 MLS Match Recap". MLSsoccer.com MatchCenter. Archived from the original on June 2, 2017. ^ "All-Time Attendance". Sporting Kansas City. Archived from the original on December 21, 2016. Retrieved December 14, 2016. Wikimedia Commons has media related to Sporting Kansas City.